Were Donald Trump’s Trump University real estate seminars a fraud? Some former students don’t think so. Lawsuits call Trump’s real estate seminars an expensive rip-off. Some alumni disagree. Donald Trump speaks as Trump University President Michael Sexton looks on at a news conference announcing the establishment of the program on May 23, 2005, in New York. If you’ve heard of Trump University, the pseudo-educational apparatus that promised to share Donald Trump’s secrets to business and real estate success, you probably haven’t heard good things. 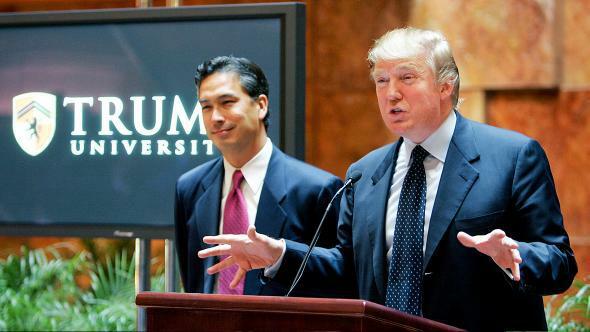 Trump University—which was not a university but a series of online courses and in-person seminars—changed its name to Trump Entrepreneur Initiative in 2010 after multiple warnings from the New York State Department of Education about its misleading use of the word university. It is currently the defendant in two class-action lawsuits and one fraud lawsuit, filed by New York state Attorney General Eric Schneiderman, which are all founded on claims that the program pressured students to pay tens of thousands of dollars for a “Gold Elite” curriculum that purported to offer insider knowledge and personalized mentoring but in fact offered very little of either. Trump’s opponents hope that Trump University’s legal troubles and history of dishonesty can slow Trump’s momentum in the Republican primaries. But for some people, Trump University is more than presidential debate fodder or a late-night punch line. It’s a notch on their résumé. Scores of Trump University “graduates” list the credential on their LinkedIn profiles. Why, after all the terrible press Trump University has gotten, would anyone brag about paying thousands of dollars for a real estate seminar? But most people who put Trump University on their LinkedIn profiles were not joking. Many felt that they’d gotten their money’s worth and were legitimately proud of the professional accomplishments they’d made after attending Trump University seminars. Michael LaMonica, who now owns an estate sale and art auction business in New Jersey, volunteered that he was named Donald Trump’s “Student of the Month” in October 2008 and was even profiled on Trump’s blog as a “real estate success.” Kevin Andrews decided to attend Trump University seminars after selling the business he owned with his wife to start flipping properties. “We spent a ton of cash and our first deal paid for it,” he told me in an email. “We followed the program as it was taught and we got the results that were promised.” Joel Halley, who spent about $1,000 on online Trump University courses about sales and marketing—much less than many of Trump’s students—said the program taught him concepts about marketing that he uses today as the owner of a computer repair shop in Melbourne, Australia. The trouble arose after Malani and his cousin gave in to the pressure to sign up for an additional program, to the tune of about $18,000, which he borrowed from family members. “That was a rip,” he said. “We got everything out of the first class, and the second one, they were supposed to send a guide to us and he was supposed to do deals for us and everything, but it didn’t happen. We were doing everything ourselves.” The instructor who was supposed to be mentoring him sporadically called Malani to ask if he could partner with him and his cousin on their real estate business, but he didn’t offer any guidance. Malani eventually made back his investment in Trump University as a broker, but he felt that the second program was a waste of money. Margaret Tom, 69, also lived in Hawaii but came from a very different background when she paid about $35,000 for multiple Trump University seminars and a private coach in 2010. About to retire from a career in social work, and having seen her retirement savings diminished considerably by the recession, Tom was looking for a way to boost her retirement income. “This was like a ready-made business, and you’re getting tons of knowledge from somebody that is an expert in it, that helps you get that quick start,” she said. Tom liked her mentor, who spent a full three days with her in Hawaii, and the educational materials gave her the confidence to buy a condo in Hawaii and four houses in Detroit, which she rented out and then later sold. But she found Trump University’s curriculum thin on details about business administration, and she realized only after paying for the program that Trump himself would not make any personal appearances during the program. Tom just laughed when I asked if she was a Trump supporter. “First off I’m a social worker, so I’m a Democrat through and through,” she told me, before comparing Trump supporters to European nationalist movements and suggesting that his success stems from a backlash against the Black Lives Matter campaign. “Just looks good in the profile; that’s it,” he responded. In a way, the persistence of Trump University on former students’ LinkedIn profiles helps explain Trump’s appeal as a presidential candidate, even though many of those former students are wary of Trump the politician. Trump was able to entice people into paying for Trump University because he’s enjoyed respect as a businessman for a very long time. The people I talked to who list Trump University on their LinkedIn profiles aren’t chumps. They paid for Trump’s cachet and insider knowledge, and to a greater or lesser degree, they got it. As far as I can tell, their successes in real estate or business have more to do with their own initiative and hard work than with what they learned at Trump University—but they still credit the Trump-branded seminars with giving them that initial push. It’s going to take more than some accusations of fraud to make people forget what the Trump brand has represented for decades. Trump is tapping into a deep reservoir of goodwill, and it’s nowhere near exhausted. You might consider LinkedIn a bellwether for Trump’s reputation as a businessman. As long as people credit Trump University for their success—or just think it looks good on their résumés—the rest of us will have to take Trump seriously.